I got this in a lot the other day & I think I'm going to use it to tow my Honda Odyssey. She's soaking to get rid of those decals now. I like what you did to your Odyssey. I have one of those that I built in the 80's. 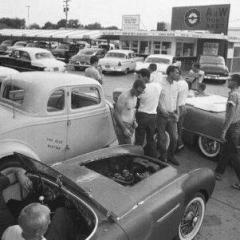 It is hauled on a Chevy Luv. Thanks Brad, I like your set up, it's pretty cool. I got the cab & box in primer finally after some filling & lots of sanding. The hood needed those big holes filled too. The chassis isn't in bad shape but I need to find a front & rear end for it. I thought I had one in my stash but I can't find it. I found a 2wd set up but that's not gonna work for me here. I found an older style grill I like better too but it needs some help. Anyone know where I can find some 4x4 springs & axles for this? This is a cool project. I will be watching to see how it turns out. 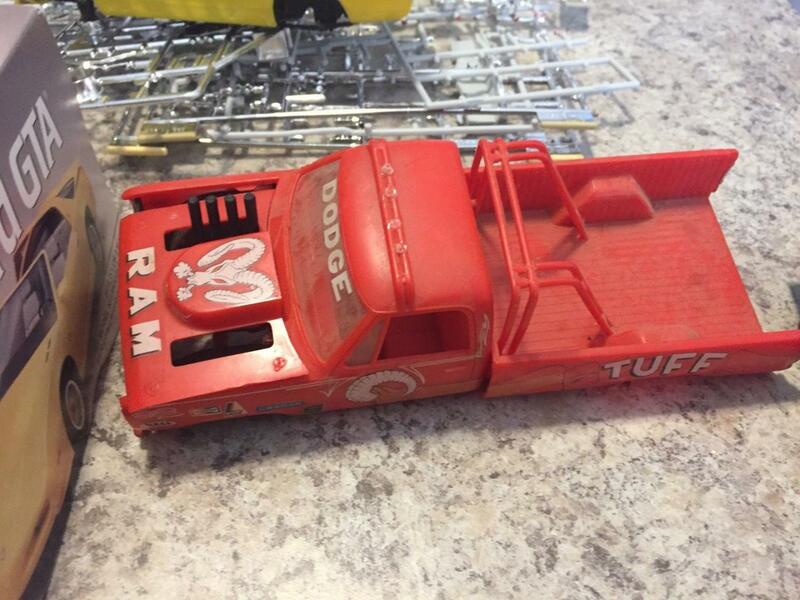 You might be able to use axles from the revell dodge ramcharger. Or with some modifications you could use the axles from a revell gmc plow truck or big game country truck. Nice...! I always had a soft spot for the 71-76 Dodge long bed pickups and van kits. I haven't had much bench time but I did get the engine started. I have the same kit that I’ve taken the 4x4 stuff off of and would like to make mine a 2 wd. Maybe we could work out a trade? If interested I could send pics of what I have next week. We are out of town until next Saturday so I don’t have access to my stuff right now. Nice work on that engine! STARTED!?!? It looks like it RUNS! Great job! Thanks guys, I appreciate all the compliments. It makes me feel good that you guys think it looks that good. I don't buy much aftermarket stuff for detailing, I just use what I have scrounged from old electronics & whatever I find for wiring & plumbing. Thanks for the offer Jon but I got something that will work. PM me your address & I'll send you the front end I have, It's built but should work fine. Don't worry about trading anything, I'm happy to give it to you to help out a fellow modeler. I don't buy much aftermarket stuff for detailing, I just use what I have scrounged from old electronics & whatever I find for wiring & plumbing. I am in the same situation and have found ways around spending lots of $$$ to produce some fine details. Nothing against aftermarket, its great to have options, I just don't have very deep pockets for my hobby yet! I got most of the chassis done. 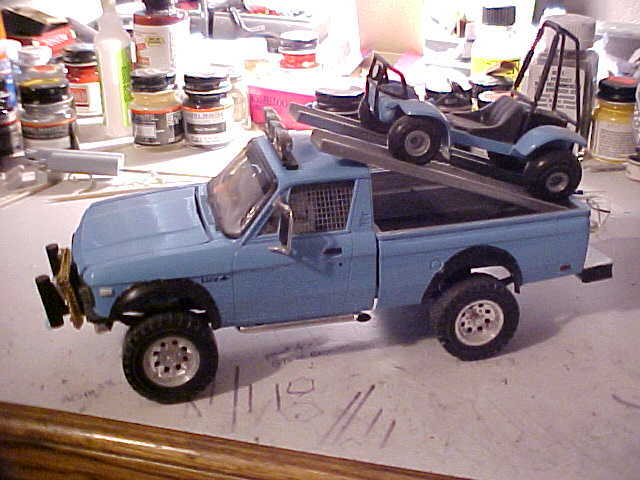 I used the front & rear ends from a Ramcharger kit. The stance & fit looks o.k. to me. That is coming along nicely! Sure wish those were readily available! Nice looking chassis! Your weathering looks great! The suspension looks right at home on tha chassis. Really like like your weathering. Sure wish those were readily available! Me too, They're such good looking trucks to me. I think they'd sell pretty good if somebody reissued them. Thanks a lot guys. It's been tough finding time to work on this thing. Work, fixing my daughter's car, getting ready for winter & a snow storm of 3"-6" today isn't gonna help. Not much but I got the interior done & some paint on the cab. Looks great!! Your 4x4 conversion is a sweet looking one, I have to remeber that one for later. Just a little more, the grill & hood. I don't know if I'll have time to finish this. We're closing on a new house today & I'm gonna have to start packing all this BLAH_BLAH_BLAH_BLAH up soon. Rumor has it, based on comments in another thread, that this kit will be making a comeback soon as a reissued MPC 2wd D100 1978 model.